Our twins’ 6th birthday is coming up (side-bar: I can’t even believe it! I’ve been blogging since they were toddlers!!). So I wanted to talk a bit about kid presents & parties. In the past, we haven’t really done kid “parties,” per se. For their first birthday it was literally just the four of us (the two girl + me and hubs) at home. For their second birthday, we decided to have a small get together last-minute and just had cheap food like hot dogs, chips and salsa, and homemade birthday cake. For their third birthday, we were in Utah with family. We bought cupcakes and that was the extent of it. For their fourth birthday, we had an at-home party. This was the biggest party to date: we bought cakes instead of making our own and we rented a bounce house for a couple hours. 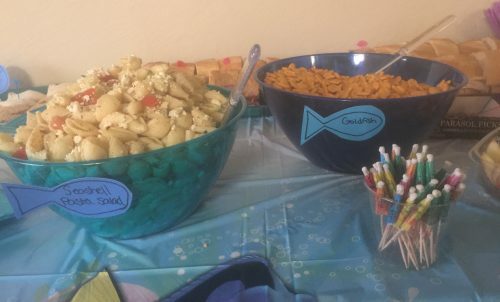 I tried to keep cost down, as we did all our own homemade decorations, a lot of homemade foods, and since the party was at our house we had no overhead in terms of renting a party venue. In the end the total party cost was about $500. For their fifth birthday, we were in Texas with family. We went to my brother’s house and had a pool party there. Again, we bought some cupcakes but that was the extent of it. They begged and pleaded for a Pump It Up party!!! This will be our first year to actually rent a venue and have the party somewhere other than our home (or a home of a family member). And you know what????? They’re EXPENSIVE!!!! We wanted to let our kids have the experience they desired. It’s their first time ever, after all. But we also had to figure out a way to do so that would work with our budget. First, we knew a weekend was out of the question. The cost is substantially more on weekends. No problem, we decided to do it on their actual birthday (a weekday) in the evening so their friends who have parents that work can still attend. That saved us nearly $100 right off the bat! We also decided to go minimal with basically everything else. We kept the invite count low so we could get the smallest party package. Pump it Up provides invitations so we used those instead of buying any. They also provide paper products (plates, napkins, cups, and cutlery). The big downside is we have to do our food through them. The party package includes 2 pizzas (+ drinks), but since the girls are still at the age where many parents attend the party, too, we felt like we needed to add 2 more pizzas to the order to accommodate adults who may be present. That was an extra $28 upcharge ($14/large pizza – really not a bad price. More expensive than the $5 Hot and Ready pizzas I would’ve otherwise bought, but $14/pizza isn’t a terrible price gouge like it could have been). I’ve also spent right at $30 for goody bags and things to go inside (e.g., candy, small toys, stickers, etc. ), and I plan to spend about another $20 for cake (which is the only “outside food” they allow you to bring). I was also told I could supply bottles of water (they provide pitchers with lemonade, juice, and soda), so I’ll likely pick up a case from Costco to bring. All-in-all, we should be under $400 spent for the party. Not too shabby considering our at-home party cost for their 4th birthday was $500! The one other big thing is in regard to presents. Maybe this is controversial (??? ), but we decided NOT to do presents this year. The party, itself, is the girls’ present. They were aware of this when they made the decision to do a party at Pump It Up. We’ve already received 2 big boxes of presents from family back in Texas and I know they’ll receive gifts from all their friends coming to the party. There’s really nothing else they need or want right now, so with the abundance of gifts from others, hubs and I don’t feel like we need to go out and splurge on any big gifts (or even small ones for that matter) right now. The girls will need some new clothes in the coming months as back-to-school time approaches, and likely some new tennis shoes, too. So they’ll get some new things in about a month or so. But there’s no need for any big gifts right now. All-in-all, I’m excited to do a party at a party venue. The girls are super pumped up and have been doing a countdown for over a week already (their party is this coming week). I know a party at a venue will be substantially less work in terms of set-up and clean-up, and its nice that the venue provides so much stuff for us. It’s almost like we just need to show up and relax. None of the up-front planning and preparation that was required for the 4th birthday at-home party. I still prefer the freedom and flexibility of being able to do our own food and snacks, which we don’t get with this venue. But since its looking like it will be the same cost (or even cheaper) than the at-home party, plus a lot less planning and prep work, this could turn out to be the best birthday yet! What do you usually budget for kids’ birthday parties and/or presents? Have you ever skipped the gift in lieu of doing a larger party? These party places ARE very expensive. For years, my husband owned and ran a Little Gym so we were on the other side of it and also fortunate that we could have many of our kids’ parties there without charge, but the food, drinks, party bags, etc., were still quite an expense. Other years we’ve gone to other venues like Pump It Up (sticker shock, lol). The party was always our gift to our kids. I also felt they were great ways for us to socialize with our children’s friends and their parents and get to know them better. We were otherwise pretty frugal with gifts and splurges so we felt fine about indulging them on their birthdays – and at Christmas. We especially liked that we were affording them a social activity rather than buying them more stuff. Great point! I’ve always been more of a fan of “experience gifts” rather than more “stuff.” Having the party, itself, be the gift is certainly a great gift of experience! Don’t fall into the trap of thinking you are depriving your children if they don’t get the same experiences as other kids. They will not be negatively impacted if they don’t get the big party. They will be disappointed but there is always next year. You should have an at home party, cook your own food, bake your own cake and do it for less that $100. The other $300 should go to your debt. You are being crushed be your debt! You may think it is unfair to “punish” your girls for your money mistakes. But the longer you stay in debt, the more profound the impact will be on your girls. At this age they won’t remember much about the money stress or the big party for that matter. But they will remember the tension in the home, and the money stress on mom in the coming years. I guess what I am trying to say is your priority should be on securing your future and reducing money stress in your home. This will have a much more profound impact on your daughters than the experience of a cool birthday party. That being said, I am sure you will go ahead with the party as planned. It just doesn’t make sense to me. Well, we’re already in a contract at this point will all the invitations sent and RSVP’s received so, yes, we’ll stick with the party this year. I agree with your sentiments and don’t think it’s a “punishment” for the girls to not get a party. 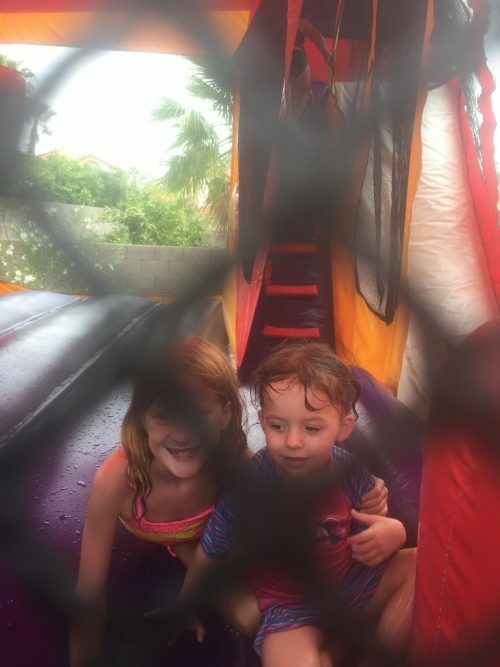 In fact, as I mentioned, this is the first year we’ve ever done a party somewhere other than our home (or the home of family) and only the second of what I would consider a “real” party (something that cost over $100) in their 6 years of life. So I don’t think this is an out-of-the-question type of thing. We’ll likely continue on an every-other-year plan where we alternate smaller family get-togethers with friend get-together/parties. Your life……your choice. I guess that is why it is PERSONAL finance. I do sincerely hope that your girls have a wonderful birthday party. Not doing gifts as the party is the gift isn’t controversial at all, so many people do that and it’s smart! More controversial is you spending $400 on a party when you are having such a hard time making ends meet right now…. I agree with you and Margann above. It’s too late for this year but next year, Ashely, you should figure out a couple options you can afford then ask them which one they want. I also like the idea of having birthday parties away from home so most years we rent a pavilion at the park. I don’t know what kids parties have gotten so big and over the top anyway. My niece was at one that had a petting zoo and pony rides! Oh wow. My daughter in San Francisco and her circle of friends have low key parties at the park. The host buys or makes a vegetable and fruit tray and cupcakes/cookies and serves water. It’s held on a weekend morning. Parents socialize and there are usually few gifts. Cost- maybe $50 and these folks all probably make $250,000 and up. Most of the moms do not work. GD just turned 5. That’s kind of what we did with our kids. At that age they liked the big parties, so each got a couple of big parties between about ages 5-9, but not each year. After that they grew out of that and it was back to small at home parties. I think it’s ok, even though you are in debt, as long as you aren’t going more into debt to pay for the party and paying cash for it. Plus, like you said, that is also their gift from you. Enjoy! They are only little for such a short time. I’d have to agree with this – even when you take into account that this is two children’s birthdays. This is a very large dollar amount – for a party. A practice that I’ve enjoyed seeing is instead of gifts – children each bring one of their own gently used books that they are done using to the party and exchange for different books. Replacing the need for a loot bag – as they’ve each gone home with a new to them book. My kids never had a big party. But, that was 50 years ago. My daughter told her daughter the party in the park was the gift from her. I knew a woman who gave her daughter a $500 party because she could not afford gifts and thought others would give nice gifts. At the time, this woman was two rent payments behind and about to have her electricity cut off. The next birthday party for the next child was a $500 princess party because “she will only be four once.” I am aghast at pricey parties for little kids. What will they expect when they are teens? As a long time follower, I will just say it out – this party is a huge waste of money and the wrong decision! I understand wanting to make your children happy but truthfully, they are young enough to appreciate the usual cupcakes at home and in a few years, won’t even remember this day. The $500 you are spending could have gone to a number of debt repayments or just extra cash in your pocket for emergencies, which always seem to be coming up with you! This comment comes from a place from support, you need to reevaluate where your money is going! I sometimes feel like we, the readers, want Ashley to be out of debt more than Ashley wants to. Dave Ramsey talks about the “why”. Why does one want to be out of debt. If the “why” is not big enough, people will not do the things they need to do to get out of debt. Ashley needs to find a “why” That she can hold to when making the tough spending decisions. I LOVE the idea of party OR gift instead of both. I think it’s a great way to teach kids the value of things and help them understand that parents aren’t made of money 😉 My daughter is only 20 months old, but we definitely plan to employ this tactic for birthdays in the future (when she understands! ).